This Aluroll Classic Door is one of the highest quality made-to-measure automatic insulated roller garage doors. Aluroll have been manufacturing insulated roller shutters in Shropshire from German components since the 1970’s. The high quality of door construction and service provided by Aluroll is second to none. Standard features on the Aluroll insulated doors, include autolocks, full powdercoated roller box enclosure, high quality bearings and motors (5 year guarantee), stainless steel handsets and treble draught seals in the guides, which make this roller door very high quality. Unlike other insulated roller door manufacturers, Aluroll do not try to sell you extras. All these features are included in the price, which Arridge discounts by 42% off the list price. We are the leading on-line discounter of all Aluroll doors and shutters, with weekly deliveries to most areas. 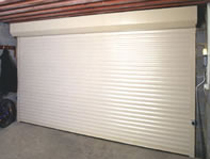 View our sizes, prices and order the Aluroll Insulated Roller Garage Door here. The Aluroll Classic Door has a 10 years warranty on the powder coated slats, 5 years warranty on the Somfy or NRG Motor and 2 years warranty on all mechanical parts. 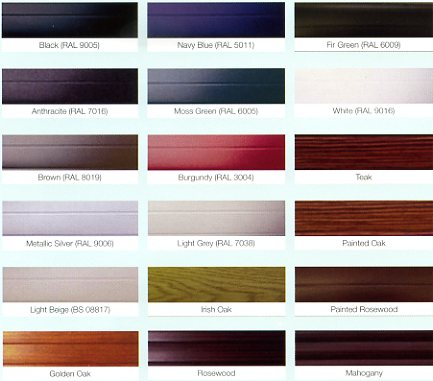 A choice of 14 standard powder coated colours and 4 woodgrain laminated finishes is available. The full box housing is a standard feature. It makes a very neat and secure installation. 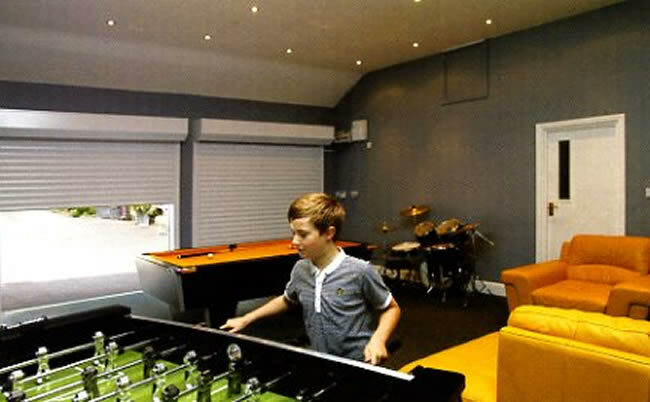 All our insulated roller doors are made to measure and are electric with remote control, as standard. The classic door has a curtain made up from 77mm foam filled slats, 15mm thick. All doors come with 2 mini handsets, internal wall switch with courtesy light and manual override facility. The bottom rail of the insulated roller shutter curtain holds the deep rubber seal which prevents draughts and debris blowing under the door. The powder coated guides have treble draught seals giving quiet operation and draught proofing. The bottom rubber also acts as the sensor to detect any obstacles that may impede the door from closing. If an obstacle is detected, the door will automatically reopen. The width of the insulated roller garage door is a total width including the two guide channels (90mm as standard - 70mm on request). The height includes the 300mm roller box above. 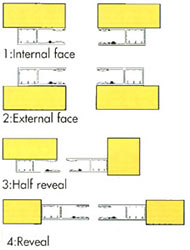 Internal Face is the most popular way to install the door with the guides hidden on the rear of the brickwork pillars and the box is hidden behind the lintel. 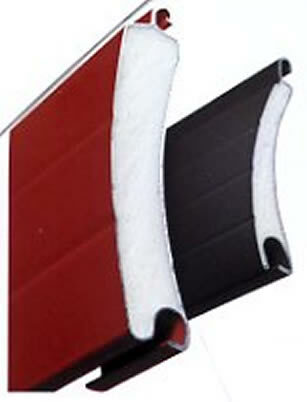 This flexible product also allows between the brickwork fitting, external fitting and combination fitting. The Compact model insulated roller door is made from thinner 55mm deep slats allowing it to roll into a smaller box housing. This is ideal for limited headroom applications etc. The box housing is 205mm square for doors with a total height of up to 2400mm. For doors over 2400mm high the box is 250mm square. The Compact insulated roller door uses 68mm guide channels. Other product details are as for the Classic door. 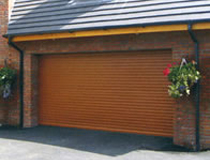 Arridge Garage Doors offer a discounted supply only service (all prices include delivery) or a full supply and installation service, whereby the door is charged at the discounted website price and installation is quoted as a separate item. Please complete the self survey form before contacting us. In this way we can offer prompt and accurate advice, service and quotations.